The Zebra Club - later renamed Saigon Palace - was an underground rock club in 1980's San Diego. It is now a meat market. Flyer artist is unknown. Giraffe shoe and zebra shoe in kidskin and velvet painted entirely by hand. 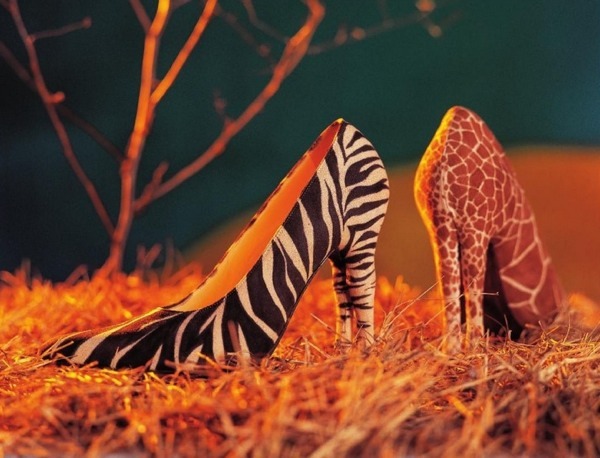 Heels of carved wood covered with hide evoking the hind legs of a giraffe and a zebra. Created by Stéphane Couvé Bonnaire, winner of the competition under the category for the stiletto heel organized by the Style Bureau of the National Federation of the Shoe Industry in 1995. It seems unlikely that a French shoe designer knew about San Diego garage-rock; then again it seems unlikely that a footwear website knows about the same matter. By the way: we wrote already about Fullerton's Nu-Beams (appearing at the Zebra Club May 17, 1980).